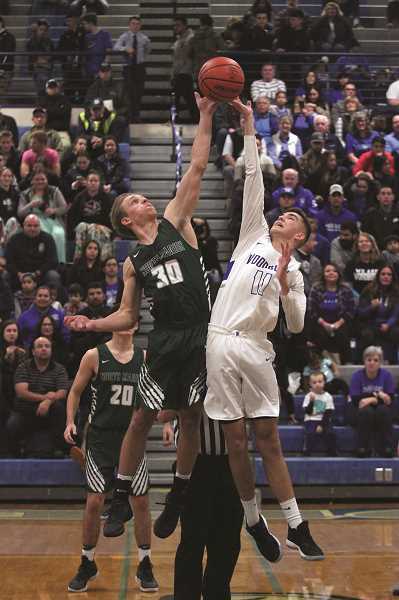 Friday night at Woodburn High School had all the feel of a late-season playoff game as the Woodburn Bulldogs and North Marion Huskies tipped off for the 2018-19 boys basketball season. And while the Bulldogs opened and closed the game on a pair of dominant, high-scoring stretches, there was plenty of competition in between with Woodburn pulling away for an 82-63 victory over the Huskies. "I think it's awesome that we're playing Woodburn again," North Marion head coach Tully Wagner said. "The place was packed, and we're so close together. There's a lot of interconnectivity between the two communities. It was really neat to start that up again." "A lot of emotion in that game with it being a rivalry," Woodburn head coach Raul Veliz Jr. said. "All the players know each other, so we kind of expected that." It was a series of firsts for both teams opening the season. It was the first game for Veliz as head coach of the Bulldogs. It was the first game as members of new conferences for both teams — North Marion returning to the Tri-Valley, while Woodburn takes up new residence in the 4A Oregon West. And it was the first game in a Woodburn uniform for senior R.J. Veliz, who led all scorers with 34 points in the win. "He definitely has the ability to take over a game, but he's always been somebody who works to get other people the ball and makes the right plays, and that's something we've been preaching for so long," Coach Veliz said. "He mentioned this year, 'Dad, we've got a lot of options this year.' He's excited to play with these guys. He's excited to have a lot of weapons and people who are able to contribute 1-through-12 on our team." 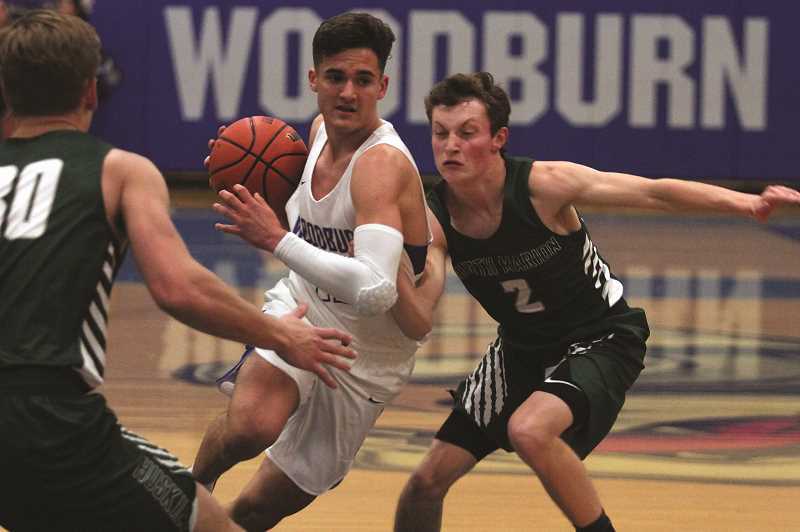 Senior guard Trevor Karsseboom came off the bench to score 16 for the Bulldogs, but it was Veliz's heroics in the final quarter that delivered victory for Woodburn. After falling behind 24-3 in the first quarter, the Huskies rallied in the second quarter to pull within eight points. They kept the score close throughout the second half, until Veliz ripped off 18 points in the final quarter to give the Bulldogs the 19-point victory. "He knows how to find that time in the game when he needs to do things like that," Coach Veliz said. The fact that R.J. Veliz's big fourth quarter was necessary in the first place was a testament to the play of the Huskies, who recovered from a disastrous first quarter to push Woodburn in the second and third periods. "You've got to give (Woodburn) credit because they were sharp from the get go, but we obviously struggled taking care of the ball and looked out of sorts for the first five minutes of the game," Wagner said. "It's something we like to tell our guys: You can't win a game in the first four minutes of the game, but you can lose a game." North Marion lacks the size in the paint that has defined the program in previous years and is looking to take advantage of its playmakers on the perimeter to outrun opposing teams and punish them in the transition. After the Huskies recovered, they were able to display their potential this year by streaking up the court and quickly whittling away Woodburn's lead over the course of the second quarter. "We're going to be a much better team in transition this year," Wagner said. "We were able to see over the course of the first game, we scored more in transition and were much better playing up tempo." Coach Veliz was pleased with how the Bulldogs opened and closed the game, though he admitted that some sloppiness in the middle quarters was expected due to the amount of transition the team is negotiating. Raul Veliz Jr. was an assistant coach at Blanchet Catholic High School last year, where his son was a three-year starter and All-State point guard for the 3A Cavaliers. Fellow Woodburn starters Diego Torres and Ryan Stebner were also members of the Cavs last season, while 6-foot-7 senior post Lincoln Vansmoorenburg is making his return to basketball after last playing in eighth grade. Mixing the new players, a new coach and a new playbook with the existing roster is not an easy exercise, though Veliz credits his seniors — 10 in total — with putting the team-first mentality as their top priority. "It's actually been a lot more smooth and an easier transition," he said. "We definitely have a senior-heavy team, and being upperclassmen, a lot of them understand this is it for them. They've all bought into what we've been preaching about. Making the right passes, making the right decisions." When the Bulldogs finally coalesce into the product they expect to feature in a playoff run, the addition of three new starting-caliber players to an already veteran roster in the new 4A landscape could be just the recipe needed for the first deep post season run in Woodburn in years. "Now it's trying to meld with what they did last year and taking a lot of those good things and then adding our piece to it to form what we're trying to do this year," Coach Veliz said. "We have a lot of guys who are pretty equal in what they bring, so we're pretty excited for that." And for the Huskies, who are returning to the Tri-Valley Conference, where they lived from 2010 to 2014, the team is eager to make yet another playoff run with a much different personnel. Without a cornerstone post player to throw the ball to, North Marion will have to make its living in the paint by driving there instead of passing into it. "Whether we're finishing or hitting cutters or kicking the ball out to shooters, we still have to get the ball into the interior to collapse it," Wagner said. "It's been fun to really adapt and change with the style of our personnel and we're really optimistic to where we're going to be." The North Marion Huskies (1-1) went on to defeat the Sweet Home Huskies (2-1) 63-59 on Tuesday and host the Stayton Eagles (2-0) in their home opener on Wednesday. The Woodburn Bulldogs (2-0) remained unbeaten with a 72-67 win at the 5A Milwaukie Mustangs (0-2) on Tuesday and return home to face the 5A Central Panthers (1-2) on Friday.